Powell was killed when his M2/A2 Bradley Fighting Vehicle struck an enemy anti-tank mine in Baji, Iraq. Powell was assigned to B Company, 1st Battalion, 22nd Infantry Regiment, 4th Infantry Division, Fort Hood, Texas. Died on October 12, 2003. Please send information, photos, and corrections for Army Spc. James E. Powell. It will be 15 years this year that you were taken from this earth too early. I have thought of you many times over these years, I revisit the 1/22 Infantry Association website several times each year and re-look at the photos, re-read the obituary. I know we weren't as close in friendship as others in our platoon were. But you are still a brother-in-arms, and a fallen hero. Because of my own Medevac in June, I wasn't there when you were taken, I wasn't there to grieve with our brothers, and I wasn't there when they all came home. I have always felt guilty about that. I try as hard as I can to remember details of our time served together, so many memories from my service have escaped me over the years (I'm told it's residual memory loss from the explosion and concussion). One memory that always comes back is of you smoking that pipe of yours around the barracks in Texas, and everyone calling you "Jim Dandy." That makes me smile every time. I don't know how long this page has been up, or how long it has been since someone posted on it. Maybe no one will see it, but I felt I needed to post it. To Ruby, I pray that you and your daughter have been well, if my math is right she should be graduating soon and starting her own life. I hope she knows how much of joy her father was to be around, and to serve with. I wish you both the best in your lives, and to you Powell, till we meet again, keep that pipe packed "Jim Dandy!"" "Yesterday I played golf in a 'Tee it up for the troops'. A dog tag was given to me. It will be used as a ball marker to remind me and others of your sacrifice. Did you make a difference? Hell yes ! Will you be remembered? To anyone who believes in Freedom and Liberty...yes ! I hope we meet up in the future." "My soldier, my freind ,my brother I will always miss you !!" "I was a fellow Army wife. I continue to have vivid memories of the night we sent our husband's off on Fort Hood. I remember him, his wife and child huddled together underneath the light pole. The news hit with such a strong force as I was at home and got the call from another Army rep from the company. I am remembering this Memorial Day. We will not forget your sacrifice - thank you." "You came to my mind recently. I remember when you passed away. I know my husband was greatly affected by it and still thinks of you often. Hopefully you are resting peacefully." "James, Adam and I think of you often. Both Reece and Shirley have passed now and Roger just not to long ago. We know they are with you in heaven now and all of you are looking down on us. We know all of you would be proud of everything we have done with our lives just like we are proud and thankful of you for fighting and giving your life for our country. We miss and love you. Adam and Missy"
"All I want to say is that I will never forget you my friend, we served together in the USS Arctic AOE-8, and you were always a hard worker and help me around the ship, I am glad I got to know you, and you will always be in my heart, you are truly an American HEROE"
"Hello My Name Is Mary Powell I Am 17 Years Old And I am James's Little Sister, i Was Twelve Years old When James Died And It Broke My Heart B/c I Never Really Got The Chance to Bond W/ him, I Have Very Fond Memories Of James And Ruby, Im Turning 18 soon And I Just Want to Meet My sister-in-law And Meet My Neice. I am located in Columbus ohio And I'm Trying to Contact Ruby. If you Have ANY Information that Will Help Me Get Ahold Of her Please Let Me Know At; Mary.Powell86@yahoo.com"
watching every thing i do. james Powell and always will. I cry when I see those Soldiers comming home and knowing that I wont be able to hold mine no more. It breaks my heart but god takes his angels when he wants them. I love you both and james, hope to be talking to you soon in the near future love momma.D, wait untill the time is right or creat a fake web site to chat with me some how, but not in your home go to the library (hey rueb) thanks to the ones that said ruby and loren is fine I appriciate it 614-279-8270 I can hear you loud and clear on my phone.I would love to have one of the braceletts with james Powell on it. [please} contact me with info thank you." "Wow James, I cant believe it has been almost five years since you left us. I still where your bracelet. I just had a baby almosta year ago and the nurse was trying to make me take it off when I went into labor and I told her she was crazy. I have been wearing it every since you left us and it is never coming off. Hundreds of people a day ask me about my bracelet and I Prodly tell them about you, a great friend, husband to Ruby,Father to Lauren and brother n law to me and dearly missed!! "It has been a long time and it is well over due. There is no telling how many times I have thoought aboout James Powell. It was nothing but great and good memories. I can remeber the first time he came into the Army and prior service Navy, how we went to Cuba together and how 1SG threw his ruck sack the day we left, and will always remeber his wife, daughter and him the last hours before we deployed to Iraq, and how much he loved them, ifact I think that was the only thing he loved most in life. He did love his fellow soldiers too, but if I ever had to model myself as a great Husband and father it would be him. James Powell will always be in my memories. I salute you." "Spc Powell words can�t describe the pain I fell and the great moment we had together. I think of the times in NTC, Cuba and the field and the years of service we had together. I think about you every day and I miss you it�s been an honor to have served next to you in combat and to me and my family you are our hero . "I am the mother of the fallen soldier specialist James E Powell ,ruby i just found this site . sweety i have been wanting to contact you for some time now . you know i love you and lauren so much and i want to meet my grand daughter sooo bad i can't seem to think right. ruby when the time is right i prayed to god to bring you and lauren in to my life . i haven't got the chance to hold her little hand in mine please please contact me 614-747-4696] or 614-947-1166] debrap_47@yahoo.com] or www.myspace.com [put in mama_dukes08@yahoo.com"
or debrap_47@yahoo.com. that is my messinger i just learned how to use the computer and going to columbus state. [i love you] momma [614-947-1166 you never know when god will take one of us. please .if you can't . at least call me"
"To the family of James Powell, sorry for the lost of a great guy and an excellent soldier." "I believe in you guys. may god bless all of you and your familiesyou all will be in my prayers always god bless you." "Deeds, Not Words-Regulars By God!"" "To the family of James Powell. I was the Supply Sergeant with B 1-22 Infantry when James came to us. The young man had a good head on his shoulders and knew where he was going in life. Never once did I or any other NCO have to worry about James Professionally or Personally. He was as we say in the military "Tracking like a new VCR". He was a man among men. It saddens me deeply knowing he is no longer with us. I truly enjoyed working with him, he'll be greatly missed. My thoughts and prayers go out to all of you." "james was a sweet person to know i went to school with himat linden mckinley"
"It's great to know that there are still people out there who remember James and love and care for him just as much as we do. He was a great guy and we thank you for keeping him in your hearts. He will always be missed. Ruby thank you for calling us, give us a call again soon." "To the family of:James E. Powell I am so sorry for the loss of your love one. He died a hero defending freedom. May you have the peace and understanding that only comes from God. Prayerfully, we will meet in Heaven one day where we will rest in the arms of Jesus. If you need prayer or need someone to talk to, please call or write my pastor: Rev. John Pearrell, Gateway Community Church, 11677 Brown Bridge Rd., Covington, GA 30016. (770)787-1015. Your friend in Jesus Christ,"
"SPC. Powell, I came to 1-22 Infantry fresh out of basic. The first friendly person I ever met in the Army, let alone the infantry, was James. Somehow he knew that I had kids and a wife and as a SPC he took it upon himself to find me housing. He was the warmest welcome I have ever had to strange surroundings I have ever had, truely a southern gentelman. It's hard to find good people these days, but I hit the lotto with Powell, as he was the most honorable, friendliest SPC a PV2 could find. He truly abided by the Army's LDRSHIP values, and taught me to be a kind and understanding infantryman. (With the utmost honor intended)"
"We thank everyone for for remebering James and keeping him in your hearts. James you will never be forgot. We love you and always will. You are our HERO. Ruby we love you and Lauren. Please contact us. Love always." "My husband and I attended Linden McKinley with James and he was always a really great guy. Even then he talked to me about wanting to join the military. I'm very sorry about his passing, we saw it on the news two years ago when it happened and I couldn't believe it. Our best wishes go out to his family and friends." We miss you and love you, you will never be forgot. You are our HERO. "To my best friend of 13 years. I miss you every day. They may have taken you away from us. But they will never take the memories we had. Please dont' forget about us. "James, Today is two years since you were taken from our family!! You are still just as missed today as you were then. We love you and we miss you so much!! Lauren and Ruby are doing great! I just talked her yesterday, she still loves and misses you even more today than yesterday! Logan stopped at breakfast and said a moment of silience for you! We love you and miss you, Kristi Your Proud Sister n Law and Shipmate"
"Ron those are awesome. I ended up buying bracelets from Hero Bracelets.org. They are great and I have never taken mine off either since receiving it. Thank you for your support and honoring James. It means the world to our family. I do not know if you have read the newspaper articles on Hero Bracelets, but I reference you. If you type in Kristi Mann in any search page, you will find articles on hero bracelets. God Bless! Kristi Mann"
"I got the bracelet at braceletsforamerica.com. They were absolutely spectacular to deal with. I wear the bracelet every day. I have never taken it off and I think of him every day. I never knew him but I appreciate every day a bit more knowing he protected me. He is my hero and I tell everyone I can about his sacrifice." "To the Family James Powell I am very sorry for your lost. I continue you praying for you. I am sorry that his little girl is going to grow up without her daddy. I didn't know James but he was one of Americas best and bravesty! May the Lord always be with you and lead you. God bless you All." "Ron where did you get the braclet? James is my brother n law. He is truly missed and truly loved. I know we would love to get one." "Today I received a bracelet with James Powell's name engraved on it. I will wear it with pride, remembering always that he died for me. HE IS NOT FORGOTTEN. I had the bracelet personalized with his name so that I am always reminded of the sacrifice these soldiers make every day. GOD BLESS and MERRY CHRISTMAS." "I'm trying to find Mrs. James E. Powell for I have made a quilt to honor you and your little girl. I feel with all my heart that we need to honor the family of James E. Powell and the only way I know is through a quilt made out of love to comfort the family. I hope you will read this and contact me so I can send you both a quilt. God bless you and your little girl and know that we American know that your husband is a true hero"
"James was a great guy as well as a best friend. We were best friends for 13 years and still will be. My heart goes out to Ruby and Lauren we will always be here for you. We will always pray for you and keep you in our hearts. Thanks for everything. Love Adam and Missy Warrix"
"We give honor to your name and pray God's blessings on your family and loved ones. 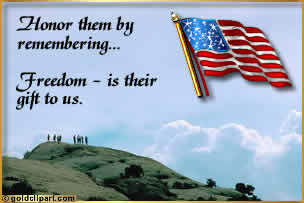 You gave all so that we can be free. May we, in turn, live our lives always doing the best we can each day, realizing that we will never be worthy of your gift. 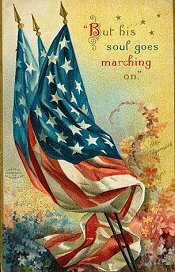 We salute you and pray God's blessings on America." "To Ruby & Lauren...I just found out about this site & wish I could have found it sooner...My heart just broke when I heard the news. I pray for you & Lauren every day. John is over there now and it scares me so much...James was an awesome guy and I'm so glad that we got to know him for the short time that we did. I have been trying to contact you forever...Email me at LSapp5544@yahoo.com. Love & hugs to ya'll"
"hey powell, you were a good guy and i was privileged to have known you. my heart goes out to the Powell family. you will not be forgotten." James will never be forgotten for what he has done. He has truly touched so many lives as my son Bu3 Doyle "Wayne" Bollinger has. He was killed in Al Kut, Iraq June 6, 2003"
"Im a wife of ssg minzer who was in b co with this young man, we will miss you james, you where a great young man, i think about you everyday along with wheeler who die the same day you did who was with c co 1/22 4th id. i send my love to your wife and that precious little angel your daughter, we miss you here rudy here at ft hood." "Specialist Powell, goodbye soldier and thank you. You are my hero." "God bless, you are not forgotten. REGULARS!" "I was so sad to here of James death. He is truely a hero. I know of him through a friend of his in Iraq who told me he was a really great guy that they all looked up to and will miss greatly. RIP brave soldier...till I finally get to meet you." "Thank you James Powell, you will not be forgotten. Your bravery goes beyond words. I want to express my deepest gratitude for your sacrifice. To the family and friends, my prayers and deep condolences in your loss. May God strengthen you from knowing that fellow Americans and people around the world care about you and grieve with you in your loss. God bless you all. A very appreciative fellow American,"
"James you were a great husband, father, and friend. I wish I would have gotten to tell you bye before you left. Your nephew Logan misses you so much. He has to catch himself asking if he can go see Uncle James. George and I talk about you often. You are loved and missed greatly. Dont worry about Sissy and Lauren we are all looking out for them. Miss giving you a hard time! :)"